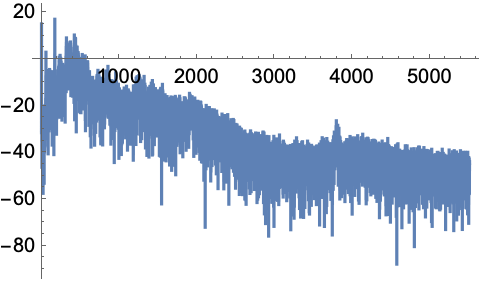 plots the squared magnitude of the discrete Fourier transform (power spectrum) of list. plots the mean of power spectra of non-overlapping partitions of length n.
uses partitions with offset d.
applies a smoothing window wfun to each partition. pads partitions with zeros to length m prior to the computation of the transform. 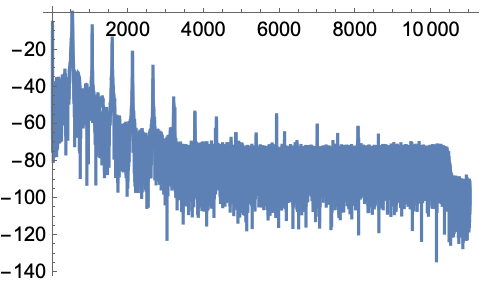 plots power spectra of several lists. plots the power spectrum of audio. plots the power spectra of all audioi. In Periodogram[list,n,d,wfun], the smoothing window wfun can be specified using a window function that will be sampled between and , or a list of length n. The default window is DirichletWindow, which effectively does no smoothing. Periodogram[list,n] is equivalent to Periodogram[list,n,n,DirichletWindow,n]. Periodogram works with numeric lists as well as Audio and Sound objects. For a multichannel sound object, Periodogram plots power spectra of all channels. 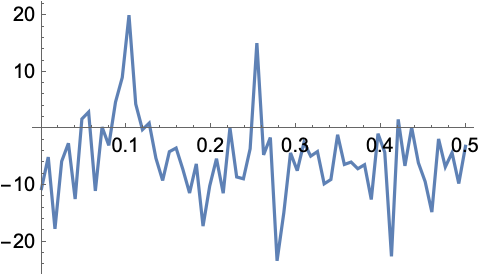 For real input data, Periodogram displays only the first half of the power spectrum due to the symmetry property of the Fourier transform. Compute the effective power spectrum using PeriodogramArray. With the setting SampleRate->r, signal frequencies are shown in the range from 0 to r/2. The scaling function can be "dB" or "Absolute", which correspond to the decibel and absolute power values, respectively. Periodogram also accepts all options of ListLinePlot.